Internet of Things (IoT) has emerged as one of the most disruptive forces driving the digital transformation. All industry leaders are at the heart of elevating this innovative force. By 2020, global spending on IoT will have 15.6% of compound annual growth rate and the estimated market size will be $1.29 trillion, as predicted by the International Data Corporation (IDC). And, Gartner predicts that 95% of new products will have IoT, moving from intelligent computing to interacting with humans without a centralized control and command. Unfortunately, almost 75% of IoT projects fail despite the increasing ubiquity of IoT implementations, as per the recent study by Cisco. Major concerns like scalability, security, data connectivity and difficulties finding a right enterprise IoT platform for implementation compound the obstacles. Microsoft IoT Central is a fully managed, highly scalable IoT SaaS solution. It addresses all the obstacles to build enterprise-grade IoT applications quickly. Microsoft IoT Central offers top-notch security along with regional availability, reliability and global scale of Azure. It also offers support for IoT best practices, allowing every organization to benefit from transformational IoT. With Microsoft IoT Central, any organization can get started rapidly, connecting devices in few seconds and going forward from concept to production in few hours. As the IoT needs grow, one can seamlessly scale from a few connected devices to millions of them. Moreover, one can realize the strong IoT business benefits quickly through the enterprise-grade IoT solution set-up using Microsoft IoT Central. The decrease in time, investment, and skills needed to build a powerful IoT solution makes it easier for enterprises in planning their IoT investments and in achieving their IoT goals. Microsoft, continuously, stands at the forefront of driving innovation. With the sheer speed that Microsoft introduced the IoT Central- IoT SaaS solution, proves its strong commitment towards introducing innovative services quickly. Technology-driven enterprises, globally, can take advantage of the platform, latest updates, and new features quickly to stay ahead in the competition & reap benefits continually. Very soon, Microsoft IoT Central can be integrated with the existing customers’ business systems like Salesforce, Microsoft Office 365, and SAP, to accelerate proactive service, marketing, and sales. Know how an American instrumentation giant goes cutting-edge with a cost-efficient and scalable IIoT platform. Saviant’s Azure IoT consultants have built this robust IIoT platform, which connects over 100 Enterprise Gateways that handle 3,000+ end devices and manages more than 1 million data records/year to derive real-time insights for end customers. 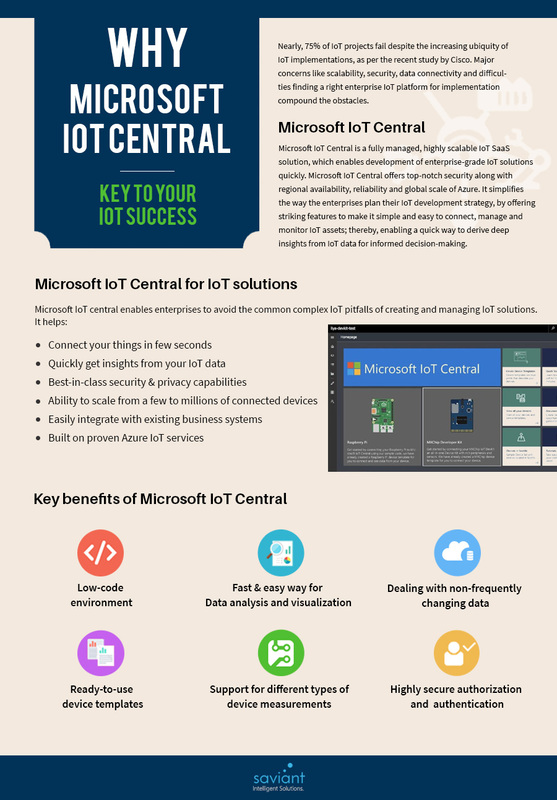 Microsoft IoT central enables enterprises to avoid the common complex & hard IoT pitfalls of creating and managing IoT solutions. It simplifies the way the enterprises plan their IoT development strategy, by offering striking features to make it simple and easy to connect, manage and monitor IoT assets; thereby, enabling a quick way to derive deep insights from IoT data for informed decision-making. Built on proven Azure IoT services, Microsoft IoT Central facilitates rapid development of scalable & secure enterprise-grade IoT solutions. Enterprises can connect the devices to the cloud directly. IoT consultants can utilize the drag-n-drop feature to classify the device attributes & visualization from the predefined set. Before launching the application, enterprises can utilize the simulation services and test it thoroughly. The devices can be templatized for faster development and versioned to get benefits of DevOps. To analyze billions of simultaneously streaming events, Microsoft IoT Central offers a fully managed analytics, visualization, and storage service called Azure Time Series Insights. Enterprises can represent their data in a meaningful, compelling and simple way using a comprehensible set of configurable tiles. Microsoft IoT Central stores frequently altering data such as device information, customer name, address, etc., in the metadata of cloud. It enables enterprises to control the devices remotely. For any desired changes, they can request devices to store the changes. Microsoft IoT central supports multiple-user authentication using Azure Active Directory, ensuring the maximum level of security. It also offers the flexibility to customize user access privileges and also provides support for advanced user management and security features like Two-factor Security and Authentication Groups. Microsoft IoT Central as a SaaS solution allows enterprises to store the numerous measurement attributes produced by the devices. This includes the numeric, non-numeric information and state of the devices. It helps businesses to monitor the devices and manage them well. Moreover, Microsoft IoT Central offers a feature to create rules to know the health of the device, various KPIs, and take certain actions on a defined condition. In addition to these, Microsoft has also announced the availability of Azure IoT Hub Provisioning Services, which enables configuration and provisioning of millions of devices to Azure IoT Hub in a scalable and secure manner. However, experts suggest taking help of Top Microsoft Azure IoT Partners like Saviant Consulting, who can assist enterprises in successful IoT implementation and avail the utmost benefits of Microsoft IoT Central. IoT (Internet of Things) as a service is presenting a huge opportunity for enterprises to thrive in this digital transformational world. There are various takes on what IoT stands for enterprises, but the basic idea remains the same; collect data, analyze the data, and then generate insights to re-engineer processes and realize the benefits. Following are few challenges which must be considered and addressed for successful IoT implementation. Read the blog here.